Greetings to all you butterfly-loving mesmers out there. The time has finally come to reveal the new mesmer specialization for Guild Wars 2: Heart of Thorns™, the chronomancer. I’m Robert Gee, and if there’s one thing I like more than time puns, it’s my mesmer. I’m really happy to be able to tell you about how this future specialization turns your elegant mesmer into a fabulous time mage. 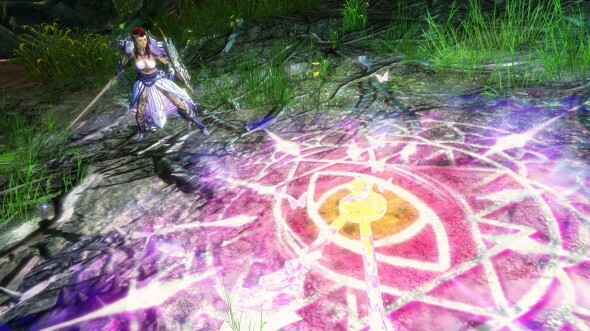 It was a unique challenge to find an interpretation of time magic that fit within the lore of Tyria while also providing engaging gameplay hooks. 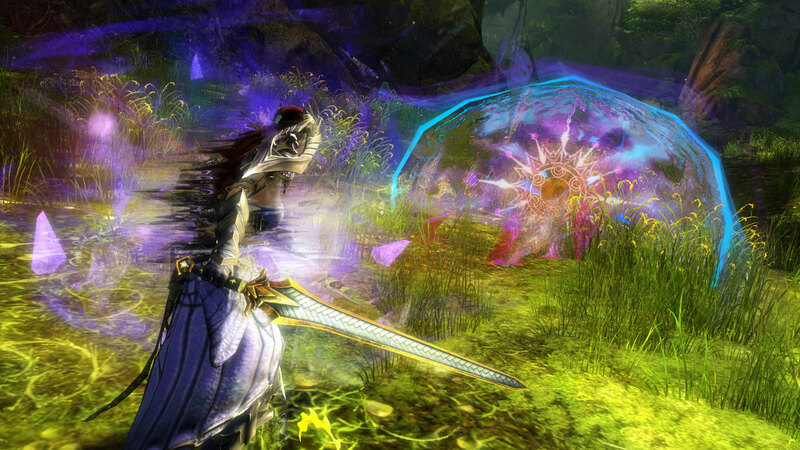 Just as the mesmer is a unique take on a spellcasting class, our chronomancer does much more than distribute speed to allies while slowing down enemies. This specialization also gives players the ability to stop and even revert time through use of their abilities. One of the core themes of the chronomancer is duality. Past versus future and fast versus slow are key themes you’ll see throughout the chronomancer’s skill set. Many skills affect both enemies and allies, reflecting the chronomancer’s ability to steal a chunk of time and use it for their own purposes. Time manipulation can get pretty complicated, so let’s start with something simple. Specializing in chronomancy grants mesmers access, through traits and skills, to a new effect called alacrity. Alacrity functions as the inverse of chill by speeding up skill recharges rather than slowing them down. Chronomancy is the only specialization allowed access to this powerful effect, and chronomancers can share alacrity with allies in limited situations, making them an incredibly powerful ally to have in any party. One of the specialization’s minor traits allows chronomancers to grant alacrity to themselves every time an illusion shatters. Maintaining a good shattering cadence can greatly enhance your effectiveness over a prolonged battle. Phantasm builds shouldn’t feel left out, though, since other skills can give alacrity to your illusions, making them attack even more often. Alacrity isn’t the only way to manipulate time, however. As an elite specialization, chronomancers will gain access to a new weapon, the off-hand shield. Even without the use of alacrity, chronomancer shield skills have special mechanics that allow them to be used more frequently when played correctly. Skilled chronomancers will be able to maximize the effectiveness of these new weapon skills to suit a variety of playstyles. One such skill, called Tides of Time, launches a wall of compressed temporal energy from the chronomancer’s shield that travels forward a moderate distance, absorbing all projectiles that are fired into it. If the wall passes through an enemy, that enemy becomes frozen in time and stunned for a short duration, while allies touched by the wall are granted a short burst of quickness. When the wall reaches its maximum distance, it turns around and rewinds itself back toward the chronomancer, applying all its effects on targets in its path a second time. An adept chronomancer can even reposition while the wave is moving, to change the returning trajectory of the wall. If you’re able to pass through the wall on its return trip, it refunds a portion of the recharge so you can use it again sooner! Saving time has never been so effective. In Guild Wars 2: Heart of Thorns, necromancers won’t be the only profession that has access to well skills. When mesmers become chronomancers, they’ll unlock access to a suite of new time-themed well skills. These well skills place a giant clock face on the ground that ticks in time with a pulsing effect. The clock isn’t just for show, either—the wells tick exactly in time with the clock hands, three times overall. When time is up, the well releases a powerful burst effect. This burst effect can be offensive or defensive depending on the well itself, but observant players can watch the hands of the clock to tell when it will trigger. For example, the Well of Precognition creates a well that alters the future of allies in the area, causing their attacks to become unblockable. When this well ends, affected allies can read the future for a short duration and evade all incoming attacks. Using this well tactically can help a team bust through defense-heavy foes while also protecting allies from counterattacks. Because there is a delay before the final effects trigger, they tend to be fairly strong. Most chronomancer wells have a fairly high recharge time, however, so be sure to keep the alacrity flowing. The chronomancer’s unique mechanic is a new shatter skill that takes the F5 slot next to the other shatters. This skill, Continuum Split, and its follow-up skill, Continuum Shift, are the most powerful abilities in a chronomancer’s arsenal and affect just about every skill on your bar. When the chronomancer activates Continuum Split, they sacrifice all of their illusions to split themselves off from the normal flow of time for a duration that scales with the number of illusions shattered. 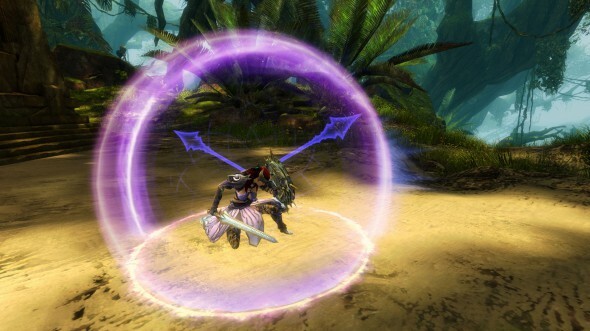 When this duration is over, or when the mesmer activates the follow-up skill Continuum Shift, they revert back to the location where the skill was first activated. Here’s where things get fun. Shifting back to the original timeline reverts the chronomancer’s health, endurance, and all cooldowns (yes, even the elite skill) back to the state they were in when the shatter was first activated. This skill essentially gives the chronomancer a reset button and allows for tricks such as casting any skill twice, avoiding a killing blow, or simply tactically repositioning yourself. Remember Tides of Time from earlier in this article? Skillful use of Continuum Split will allow you to catch two returning time waves, doubling the effectiveness of the recharge bonus while gaining twice the benefits. I’m personally excited to see what kinds of strategies will be coming from our players once this specialization is available. Time sure flies, doesn’t it? This may be the end of the article, but if you want to know more, set your clocks for Friday, May 1, at noon Pacific Time to the Points of Interest livestream, where we’ll be showcasing a demo of the chronomancer. And if for some reason you miss it live, you too can be a chronomancer and turn back time by watching the video replay on YouTube. See you all in the future!